Remember: You will get FREE picture on glass with your splashback. ...and you'll simply love it! The print is directly on the glass using UV resistant technology with protection film at the back or white protecting paint. Our job is NOT laminate or label sticker advertised as image splashbacks. UV Print on 6mm Ultraclear Toughened Glass. Over 8 meters long area (7 glass panels), 3 cuts-out for 9 sockets. UV Print on 10mm Ultraclear Toughened Glass - 2 window sills. In addition LED Lighting System fitted to lit the glass and worktop. In addition LED Lighting System fitted at suspended ceiling. free design and visualisation for customer. free design, customisation and visualisation for customer. UV Print on 6mm Ultraclear Toughened Glass - over 5.5meters long area (5 panels), 5 sockets. 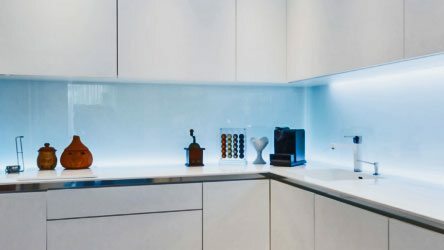 In addition LED Lighting System fitted to lit the glass and worktop, as well as separate LED under the bottom cabinets and over the top for ceiling lit. free designs, customisation and visualisations for customer. Free splashbacks measurement and quotation. Free picture from our Exclusive gallery, customisation and visualisation for customer. We're extremely happy after full bathroom's renovation. Our problem with mould is totally gone, and the colours and quality of graphic is amazing! The company's graphic has worked with us on different options and backsplash designs and we couldn't ask for more! After investing few grands in our Bathroom we've got an unbelievable outcome, 100% Happy! Thank you very much Lads! Love my new kitchen, it brought such a many colour in. 100% Recommended! Anyone who is looking for glass home decoration or Led lighting - here is the best of the best! Their standard of work is excellent and I would definitely recommend them to anyone! I found them to be Very professional, reliable, and helpful, nothing was too much trouble with them. Some time ago I had the turquoise toughened glass splashbacks fitted and we are very pleased. Jerry was brilliant from day one, great communication, top quality and service. Cannot recommend them highly enough. Thank you very much for your work! Lads spent with me hours finding the right picture for my kitchen and designing it to fit in my kitchen. Great communication and perfect job performed! Can’t wait for my glass sliding wardrobe. Great company to deal with, easy to communicate with and reasonable backsplash prices offered! Great job very professional and highly recommended. I really love the bathroom panel! Thanks lads! I finally got something that doesn’t gather any mould and dirt as I got with my previous tiles. Very nice people that helped me with the whole process from the beginning to the end. Fantastic work! Awesome work! Lads have worked with me to get the exact design I wanted and was flexible with times when it come to fitting and this is important to me! Totally finished the kitchen off and makes the whole kitchen pop! Class Lighting all around.. Thanks! 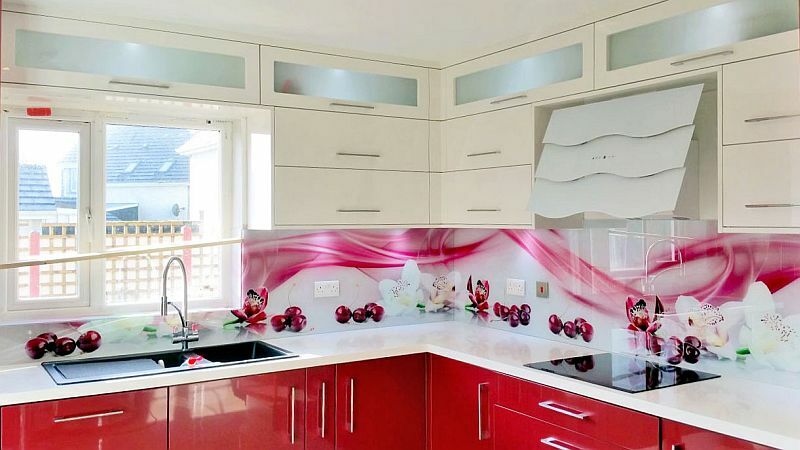 Lacobel is the cheapest option for Glass Decoration in your house, office, restaurant, etc. Lacobel is a type of glass that cannot be toughened. We also do not do sockets/switches cut-outs in this option. It's a cheap way to do it yourself. In a case of needed sockets cut-outs or Toughening we can recommend to mix Lacobel with Coloured Glass for a full and complete job. It's easy to measure and fit glass, therefore we offer a simple Lacobel Supply at a reasonable charge, that will come together with Adhesive and all Fitting Instructions. Delivery in our safety timber box starts from €39 (up to maximum €99). The minimum order size to avail of this price is 9,5ft2 (1m2). Free delivery comes with our fitting service. Nationwide fitting service available - price depends on the jobs size and location. Amazing Places, Animals, Beach&Water, Coffe&Flowers, Fruits, etc. For over 70 million different graphics visit eu.fotolia.com or send us your own picture. GET YOUR SPLASHBACK + FREE PICTURE ON GLASS with your order. Leave your info & we will contact you as soon as possible.